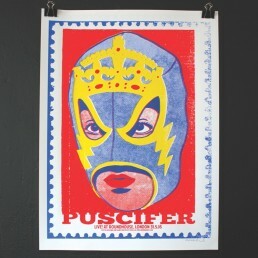 Puscifer, another personality of Tool’s Maynard James Keenan, are a permanent feature of the Mineral HQ playlist. To publicise the world tour of most recent album Money Shot, each tour date had its own unique poster design. It was a no-brainer that the office would be investing in this one from Bristol based studio Bird Brains, celebrating the UK leg (no poster for Manchester though, sadly). The hand screen-printed poster keeps a careful eye on us. View more evidence of Bird Brains’ strong wrists in their online store.